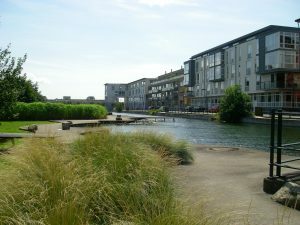 We recently visited an eco-development in Malmo, Sweden, about 10 years after it was built. Some really good features were evident, but so too were some issues that have arisen during this period. This highlighted to me the importance of the ‘check’ part of the ‘plan do check act’ cycle, so that things can either be improved or at least learned from. Have you reviewed any of your environmental initiatives over the last few years for long-term success? What did you learn? Please share your thoughts with us. When you monitor your organization’s performance, have you ever considered which variables, other than good environmental management, might be relevant to consider? Data normalization, ie comparing connected variables, is a very useful tool to use. It is a means of comparing efficiency of processes, eg by reporting on kWh of energy used per item produced. However, we often see data normalization that confuses the picture, rather than clarifying it. For example, gas that’s only being used for heating a building being normalized against production throughput. If the points on the scatter diagram are in a tidy line, as above, there is a clear correlation between the two factors. The more scattered they are, and the flatter the line, the less strong the correlation – and the less valuable it is to report the data normalized against that factor. A more complex way to determine relevance – and predict future consumption – is to consider a range of factors by conducting a full regression analysis. Different variables are likely to be relevant in different situations. 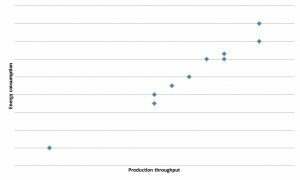 For example, electricity consumption per m2 is more likely to be relevant when it’s mainly used for lighting than when it’s used for production. Normalization of data is not the be-all and end-all of monitoring. After all, we know that we need to make absolute reductions in some areas too, eg carbon emissions. A combination of absolute and normalized data is useful, so that you can assess the overall position as well as your efficiency. We can help you to generate meaningful data – call Julia on 07904 389889 to discuss your requirements. One of the leadership requirements of ISO 14001:2015, the international standard for environmental management systems, is to integrate the environmental management system into the organization’s business processes. This is a new requirement that is often overlooked. When auditing, I often see environmental management teams documenting the issues and interested parties that they have identified, with associated risks and opportunities. On the surface of things, this may seem to meet the requirements of clause 4 of ISO 14001:2015, but this is a clause that really needs board level involvement. Many management boards already have a risk assessment process. If this is separate to the environmental management team’s process and does not consider environmental issues, then the environmental management system is clearly not integrated into other business processes. This is important because, when integrated, it brings environmental management firmly onto the organization’s agenda at a strategic level. Involving senior management in the ‘context’ requirements of ISO 14001:2015 provides organizations with real benefits in terms of understanding organizational risks and opportunities, as well as meeting the requirements of ISO 14001. We can help you to make this a truly valuable process. Call Julia today on 07944 389889 to book a review with us. I have seen a number of instances recently where chemicals were not stored in accordance with safety requirements. This can significantly increase the risk of a harmful incident, such as an explosion, fire or accidental release of toxic gas, and is easy to avoid. A good COSHH assessment can protect the environment and your neighbours as well as your employees, but only when it is implemented and checked for ongoing compliance. Are COSHH assessments in place for all of the chemicals you have stored on your premises? Have they been reviewed for ongoing applicability? Do they need updating due to changes at the site? Are the Material Safety Data Sheets (MSDS’s) that the COSHH assessments are based on up to date? Do the COSHH assessments reflect the contents of the MSDS’s? One of the issues I identified with a client came about because the correct storage requirements had not been transferred from the MSDS to the COSHH assessment. Are the storage requirements in the COSHH assessments being met? We have seen chemicals stored next to each other, over the same bund, that when mixed generate chlorine gas, and even an explosive chemicals store that vented to the gents loos! Do relevant employees understand the chemical storage requirements on your site, and why they are important? Do you have checks in place to ensure that COSHH assessments are being adhered to? This is something that you could add to your internal audit programme or daily/weekly/monthly checklists. If you need support for your environmental management system or internal auditing, please call me on 07904 389889 or email julia@questforfuturesolutions.co.uk. What’s happening to your waste? With the introduction of reams of waste legislation over the last decade, you may be forgiven for thinking that this is a sector that is well regulated. Unfortunately, that is not the case. Waste crime costs England £1bn a year and the number of illegal waste sites being discovered is soaring (over 1,000 last year – more than the previous two years combined). Illegal waste sites can be deeply unpleasant for local residents, pollute ground and water, make people ill and even kill them. So, what can you do to make sure that you are not supporting this illegal activity? Check that the company removing waste from your site holds an upper tier waste carrier licence. These last for three years (unless rescinded), so make a diary note to check for renewal. Ask your waste carrier to confirm the address of the site they will be taking the waste to. Check that the site has a permit to accept the type of waste you are sending to them. These permits are usually open-ended, so check the gov.uk public registers to make sure it is still valid. Make sure that every waste transfer is covered by appropriate documentation. In particular, make sure that the correct EWC code is used so that the receiving site knows what they are getting. Check that you receive a ‘Part E’ return (which may be a spreadsheet) for all hazardous waste transfers, and that the details on it match those on the hazardous waste consignment notes. Old lights are often removed by electrical contractors, who rarely have the correct documentation in place. In a similar way, F-Gas engineers will often take refrigerant gases away when de-gassing plant, and often do not supply the correct paperwork. If you are not confident that your business has adequate waste controls in place, we can help – call Julia on 07904 389889 to discuss your requirements.